A Syrian soldier filmed the damage at the Barzah Research and Development Center near Damascus after the airstrikes. WASHINGTON — Defense Department officials said Saturday that US-led strikes against Syria had taken out the “heart” of President Bashar Assad’s chemical weapons program, but acknowledged that the Syrian government probably retained some ability to again attack with chemical agents. Warplanes and ships from the United States, Britain, and France launched more than 100 missiles at three chemical weapons storage and research facilities near Damascus and Homs, the officials told reporters, in an operation that President Trump and Pentagon leaders hailed as a success. The president, in declaring the mission accomplished, invoked a phrase made infamous by President George W. Bush in 2003, when he claimed success in an Iraq conflict that would end up continuing for more than eight years before US troops finally withdrew. The strikes before dawn Saturday in Syria — which came in retaliation for a suspected chemical attack on civilians a week ago — were the second time in just over a year that Trump had sent missiles crashing into Syrian military targets, adding US firepower to a civil war that is one of the most complex and multisided conflicts in a generation. The attack targeted Syrian chemical weapons facilities, officials said. 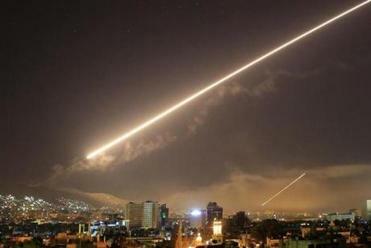 The coalition hit the Barzah Research and Development Center outside Damascus with 76 missiles, destroying the facility and setting back Syrian chemical weapons capabilities ‘‘for years,’’ according to an initial US military assessment, The Washington Post reported. The second and third targets were part of what the US military described as the Him Shinshar chemical weapons complex outside the city of Homs. The military said the strikes ‘‘completely destroyed’’ the complex’s chemical weapons storage facility and ‘‘successfully hit and sustained damage’’ to the installation’s chemical weapons bunker. ‘‘We deployed 105 weapons against three targets that will impact the Syrian regime’s ability to develop, deploy, and use chemical weapons in the future,’’ Marine Corps Lieutenant General Kenneth F. McKenzie, director of the Joint Staff, said during a news conference Saturday. Russia’s military said Syrian air defense units downed 71 of the cruise missiles launched by the United States and its allies, and claimed that the damage was not extensive, the Associated Press reported. Hundreds of Syrians took to the streets of Damascus on Saturday, celebrating and chanting to support Assad and defy the West’s effort to shake their nation’s resolve. The demonstrations were carried live on state TV, which urged people not to believe media reports that exaggerated the results of the airstrikes. Beyond the immediate question of whether the new strikes actually accomplished the stated goal of diminishing Syria’s capacity to make and use chemical agents, the attack posed the risk of drawing the United States deeper into a conflict in which Russia and Iran have more invested than ever in keeping Assad in power. The United States is “locked and loaded” to strike again if Assad is believed to renew his use of chemical weapons, US Ambassador to the United Nations Nikki Haley told the Security Council on Saturday at an emergency meeting called by Russia. The Security Council overwhelmingly rejected a Russian resolution calling for condemnation of ‘‘aggression’’ against Syria in a vote that reflected support for the allied airstrikes. But the meeting also demonstrated again the paralysis of the UN in dealing with Syria’s seven-year conflict. Haley said Russia had failed to abide by a 2013 promise to ensure that Syria got rid of its chemical weapons stockpiles. The Pentagon provided no immediate evidence that the sites that were struck were producing substances covered by the 2013 agreement between Russia and the United States to eliminate Syria’s chemical arms. Defense Secretary Jim Mattis said Friday that the US government was confident that Syrian forces had used chlorine in the deadly attack on civilians last Saturday in Douma, but did not provide evidence. The White House has cited photographs and videos from Douma to make the case, and has dismissed alternative explanations from the Syrian and Russian governments. It said that the nerve agent sarin may have been used in addition to chlorine. Chlorine, as a commercially available substance, was not included in the 2013 agreement. But the Chemical Weapons Convention, which Syria joined as part of the 2013 deal, prohibits the use of any chemical as a weapon. A group from the Organization for the Prohibition of Chemical Weapons, which had announced a fact-finding mission to determine if chemical weapons were used in the Douma attack, arrived in Damascus on Saturday, the group said. 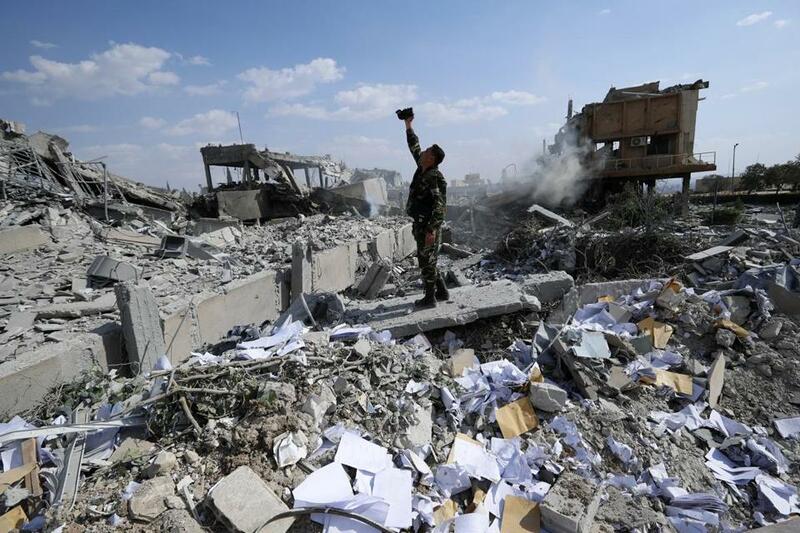 A statement by the Syrian military said three people were injured in Homs. Videos from Damascus showed Syrian air defense missiles launching into a dark night sky, and the Russian military said that at one Syrian air base, all 12 cruise missiles that targeted the site had been shot down. Defense Department officials batted down those claims, saying that the entire US-led operation was over and the targets were destroyed before Syria launched any of the 40 missiles it fired into the air. He said that all three targets had been destroyed, and that all warplanes had returned safely to base. But the strikes were limited, with an eye toward making sure they did not draw retaliation from Russia and Iran and set off a wider conflict. For that reason, Assad may still be able to use chemical agents in the future. But the limited nature of the strikes left some members of Congress and other observers underwhelmed. Sure enough, early Saturday morning, Assad’s office posted a video that appeared to show him strolling into work in a suit and tie and carrying a briefcase as if nothing had happened. Condemnation of the strikes from Syria’s allies was swift. “The United States and its allies continue to demonstrate blatant disregard for international law,” said the Russian ambassador to the United Nations, Vasily A. Nebenzya, on Saturday.